The tree of the Vavasours of Spaldington Hall has been documented by the Heralds in several of their Visitations of Yorkshire. 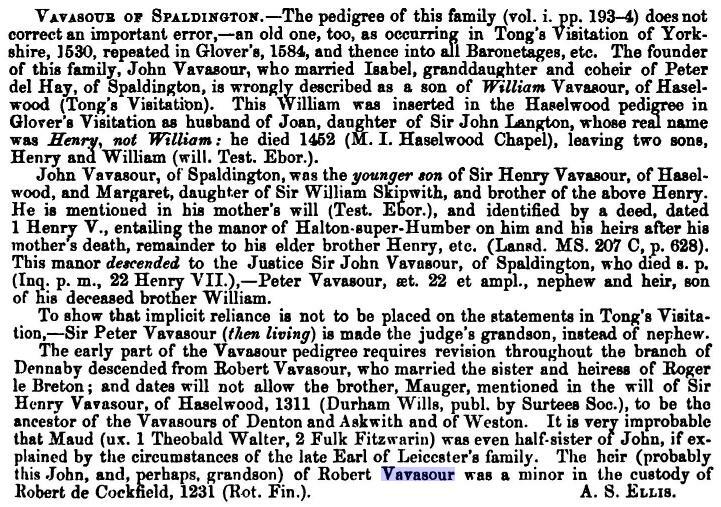 A complete tree, from their first establishment, to the last of the male line, was consolidated and printed in Miscellanea Genealogica et Heraldica, Volume 1, 1868, Edited by Joseph Jackson Howard, pages 193-196, with further information on the tree of the Vavasours of Belwood, Lincs, on page 325. The author of the tree was Thomas Beckwith, Painter of York (Heraldic painter), in 1780. However, the tree is not without errors, and some of these were pointed out in Volume 2 of Miscellanea Genealogica et Heraldica, by A.S Ellis, page 133.